This paper describes a Web-based intelligent decision making support system (DMSS) to deliver balanced scorecard (BSC) based modelling and analysis in support of strategic E-business management. This framework supports E-business managers during the strategy making process in a comprehensive, integrated, and continuous manner. The paper demonstrates how practitioners can use this system to deliver a wide range of embodied E-business strategy expertise in support of real-time decision making. E-business has evolved into an accepted way of doing business and has opened new channels for communication and selling (Whelan & Maxelon, 2001; Laudon & Traver, 2007; Phillips & Wright, 2009). It provides a new source of data on everything from customers to competitors and changes the face of competition tremendously (Hong & Zhu, 2006; Ba, Stallaert & Zhang, 2007; Sanders, 2007). As Raisinghani and Schkade (2001) pointed out: “perhaps, one of the best ways to succeed in the world of E-business is to start off with a dynamic and new E-business strategy” (p. 601). In earlier studies, an E-business balanced scorecard based model (EBBSC) for strategic management was established and estimated with real business data (Wang & Forgionne, 2005, 2007). Figure 1 presents the EBBSC model which consists of a business core, analytic e-CRM, process structure, and e-knowledge network perspectives. Wang and Forgionne (2007) explained this model could be utilized to translate E-business strategies into conceptual blueprints for strategic management control and performance evaluation as well as provide a stable point of reference for businesses to understand and explore E-business initiatives effectively. In practice, such a framework can assist E-business managers in overcoming deficiencies in awareness and proficiency regarding the business models useful to generate effective strategies (Forgionne, 2000; Forgionne & Kohli, 2000; Holian, 2002). When analytical and technical skills are not available in-house, the specialized modelling and analysis expertise suggested by the EBBSC framework can be delivered through an intelligent decision making support system (DMSS). Figure 2 depicts a conceptual functional framework of such a system for strategic E-business management, which is referred to as the EBDMSS hereafter. As Figure 2 indicates, the EBDMSS is the delivery vehicle for the EBBSC model functionality. This paper presents the EBDMSS and its role in supporting effective and efficient E-business strategy development. First, a literature review of the evolution of intelligent support for decision making in E-business is presented. Next, the paper presents the EBDMSS architecture. Then, a prototype EBDMSS is depicted to illustrate the system’s potential as a strategic E-business management tool. The paper concludes with implications for decision making support and E-business management. 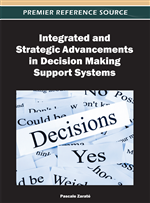 Decision making support systems (DMSS) have evolved over time and across disciplines (Forgionne, 2000; Arnott, 2004; Turban et al., 2007). DMSS has progressed from simple data access and reporting to complex analytical, creative, and intelligent support. With the rapid development of Internet technology, web-based decision support has become part of the evolution. Whether web-based or local, an intelligent DMSS is an interactive and dynamic management system that supports non-routine decision-making and evaluation (Marakas, 2003). Figure 3 sketches this evolution by highlighting the dominant decision support techniques during each decade.